Christmas Crafts for Kids, Merry Christmas Banner - Of Faeries & Fauna Craft Co. This super easy Christmas craft for kids starts with a print and cut banner pattern. As long as your little one can use paper scissors they can make this banner. The Merry Christmas wording is easily recognizable for children helping them to spell it. This banner is simple enough for the little ones to do, and pretty enough to be inexpensive decor. For now, I hung this banner onto a little frame so I had good lighting for the photos, but its permanent home is hanging from guest room dresser. I even considered hanging it outside over the front door. Any decorations you like. 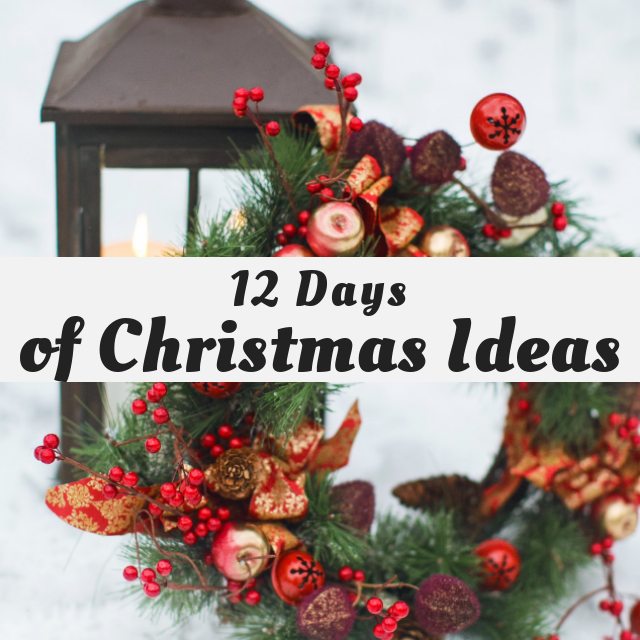 Some ideas are stickers, pine cones, candy canes, dollar store mini sleigh bells, paper snowflakes, or recycled Christmas cards if you have any. The plain banner is good for any age group from kindergarten to teenager. A young child may need help printing out the banner, but then they can have fun decorating and customizing it any way they like. As my granddaughters are still young, this one is done with Santa stickers, it can easily be winter sports stickers, forest animals or farmhouse animals. I got all the stickers in one package at Michael’s with a 55% coupon. Print out the banner onto cardstock. If you don’t have cardstock you can print the banner out on plain paper and then glue it to construction paper before cutting it out. After they banner pieces are cut, the template has marks where the holes should be, simply punch them out. Hang the banner with twine, and decorate it any way you like. Please comment and let me know how you’re enjoying the 12 Days features. I am so excited to have you join in. Super cute banner! I love the ornaments on it, too! Oh right on Barbara. Being without a printer would be more of a nuisance then having no stove. I hope it gets fixed or replaced soon for you, what a pain. This banner is very pretty! Thank you Rachel. Doing crafts with children is so much fun. I am glad you like this one. What a fun Christmas craft to make with the Kiddies!! I adore the buffalo check! Thank you. Little ones love to craft, I thought this simple banner would be something they can do and actually use for decorating. I love this Leanna! It’s perfect!. This is a cute idea to do with the little ones. Crafting together is always so much fun. I love this idea! It would be a really fun family activity. I’m so enjoying all your amazing black & white buffalo check projects this holiday season, Leanna! This Christmas banner is adorable too. I love the stickers you added to some of them. Your grand’s are so lucky to have a grandma who puts so much thought and love into making their stay a comfortable and memorable one! Thank you Marie, I knew I wanted to try something wildly different and this rustic look certainly is a different style for me. It looks awesome on that frame and with all the little bits you added. That elfish Santa hat is so cool. It was really fun to put together, sometimes a simple post is the most fun.